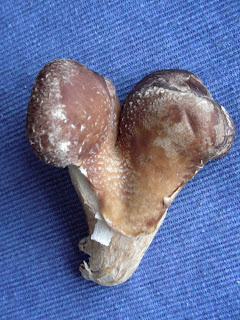 This is a heart-shaped shiitake mushroom we picked this morning! Although Blue Oysters are the mainstay of our growing operation, we also grow shiitake mushrooms. With their woodsy aroma, and robust flavour and structure, they are fabulous for winter stews and stir fries. Today, I cooked a rump roast of beef that was raised by a local farmer and friend. Paired up with some Ontario leeks, carrots and our homegrown shiitake mushrooms, it was a dinnertime feast. Because of their dense structure, the shiitakes keep their shape, even after roasting for several hours, and the flavour they contribute to the gravy is out of this world. Next time you cook a roast, throw in half a pound of shiitake mushroom caps - you don't even have to slice them up, just remove the stems and maybe cut the larger caps in half. Bon appetit! I was given Shiitake plugs this year. I plugged a fairly fresh oak log in July. The mushrooms didn't sprout. What is the germination period? I hope they have not failed? In our operation, we use enriched sawdust logs and grow indoors. Typically, it takes 5 to 6 months for the shiitakes to start pinning (ie.germinate). We don't really have any experience growing on logs, but are quite sure that it will take at least a year for the slow-growing mycellium to start fruiting (allowing for a winter season). Good luck! Thanks for the information. Patience is not always my strongest suit.